It should have been a joyous and exciting weekend for Leslie Jones, the Saturday Night Live cast member who is starring in Ghostbusters. The film opened Friday to big audiences and critical praise. But instead of being able to revel in the moment, Jones was being deluged with racist comments by Twitter trolls. 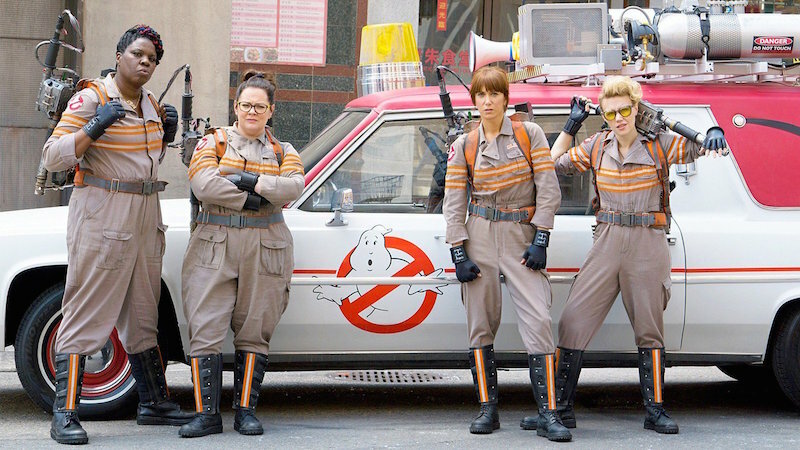 For months, trolls have harassed other people involved with Ghostbusters—they were immediately out in force when director Paul Feig announced that he was filming last summer, harassing Feig for daring to remake the classic film with an all-women cast. But the onslaught of racist and sexist hate that people directed at Jones is unparalleled compared to what other cast and crew members received. In an industry where Black women seldom land starring roles in major releases—a mere 10.8% of speaking roles go to Black characters—it’s demoralizing to see Jones targeted in this way when she should be celebrating instead. In “GamerGate’s war against Ghostbusters and Leslie Jones,” writer Colby Klaus gathers some of the worst tweets directed at Jones, including her disheartened replies to the attacks (content warning for vile anti-Black racist misogyny). Jones had been dealing with the abuse proactively by blocking people who tweeted terrible things at her, reporting their accounts, and retweeting them to expose the hate speech showing up in her mentions. But the racist attacks escalated after the release of the film, when notorious Twitter troll Milo Yiannopoulos alerted his small army of followers that Jones had blocked him. Jones spent the next 24 hours facing a barrage of hatred—and trying to get Twitter to take action against the trolls. Despite Jones and others reporting the abusers, the attacks persisted. 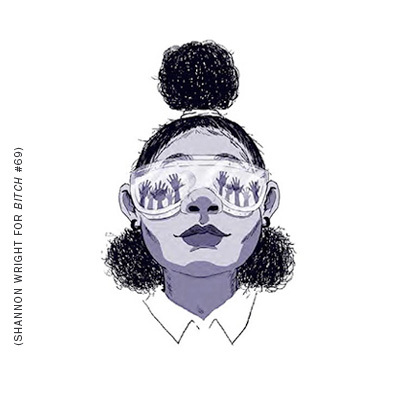 “According to Working to Halt Online Abuse, a volunteer organization that has tracked online harassment since 2000, 70 percent of the more than 4,000 people who have filed online harassment cases are women. Online users with feminine usernames are particularly vulnerable to online attacks. In 2006, the University of Maryland conducted a study in which researchers created fake online accounts and entered them into chat rooms. An average of 100 threatening or sexually explicit messages were directed at users with feminine usernames each day; masculine usernames incurred a mere 3.7 in comparison. In 2014, the group Women, Action, and the Media (WAM) undertook a study to see how Twitter deals with abuse. 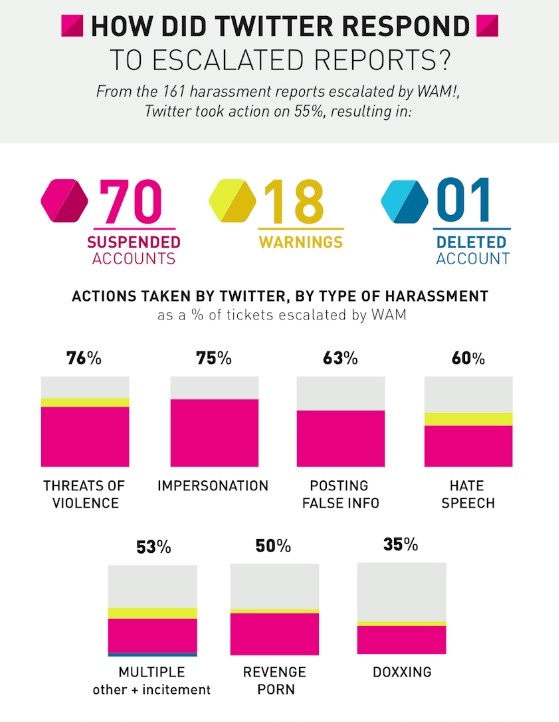 Over three weeks, WAM collected 811 reports of harassment on Twitter and passed along the 161 most serious situations to Twitter employees. Twitter wound up taking action on only 55 percent of those cases—most frequently, they suspended accounts temporarily. If Twitter does change its rules, they’ll come too late for Leslie Jones, who had to endure endless harassment for months. And it will come too late for the rest of us too, whose Twitter feeds are less enlightening now that Jones isn’t on the site.